Necklaces are such a powerful form of adornment. Being so close to our faces, they're a prime spot to add interest and beauty to your appearance. As a beautiful frame to the face, it's no wonder there are so many varieties to choose from. Necklaces are a constant addition to my own wardrobe and a real favorite of mine so watch this section as I continue to add new necklace tutorials. Nk06- Let's start doing some simple wire weaving! 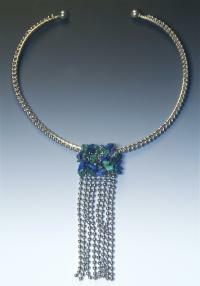 "Cleo and Friend" starts out with the silver version (and Friend) of this weaving tutorial because it is the simplest of these two necklaces with an intriguing, elegant attachment. 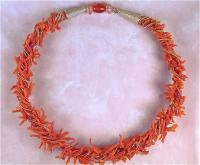 NK02-This necklace looked so regal, it was named after Queen Victoria. Crocheting antiqued chain together with sturdy velvet cord was a wonderfully successful idea while I was conceiving this project. The velvet is gorgeous and very soft on the neck. 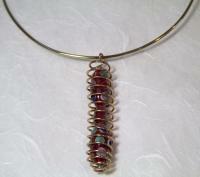 BS02 - This second tutorial in the Beginner Series, Bead Cage Pendant, furthers a beginner's skills in wire jewelry making in a few essential ways: you'll learn how to work with thicker gauge wires easily by making both the bead cage coil itself as well as learning how to make a thick gauge wire neck ring. NK05 - After many years of accumulating yards and yards of various kinds of ball chain, I finally managed to create Ball Chain Beauty by combining a simple rug weaving technique, a bit of wire wrapping and a little wire sewing. 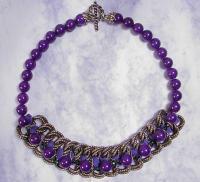 NK02 - "Grace" necklace and earrings ensemble is a stunning wire and wire bead tutorial. Black steel wire combines with the shiney white look of fine silver to create this dramatic look. Learn how to make these gorgeous, textured little wire beads with 20 detailed, step-by-step photos to ensure your success.